I emerged from my long "dark age" (1995—2017) a little over a year ago and so, I missed the emergence of the expert modular series. Coming at it as late as I did, and after some time thinking "man, I missed out those great sets that are worth loads on eBay" etc., I’ve realised some of the early sets are (for want of more eloquent words) vacuous cack. I feel silly now for all the time I wasted fawning over them. The more recent sets are beautiful, detailed and full of narrative. The astronomically overvalued 10190 Market Street is the main focus of my ire, but my feelings are similar toward some of the others. Things start to get interesting with the 10211 Grand Emporium, but even that set lacks something special in the interior. The most recent set, 10264 Corner Garage, has the story and the great architecture, but the ground floor is a worrisome return to the series' early "blandeur". Boring is the word I now associate with modulars. I’m conscious I’m likely in the minority here. The early modulars are valuable due to their age and fact that they are the first in a popular AFOL theme rather than due to design quality. The fact that many AFOLs want to complete the line collection has added to their ‘value’. It was just after the end of my dark age that the first modulars came out (2007-2008). When I first saw Cafe Corner I remember thinking it was fantastic and was very impressed by the design – which when compared to LEGO CITY buildings or my own creations at the time was on another level. I quickly snapped up the Market Street and Green Grocer but it wasn’t long before my interest and appreciation of modulars in general went downhill. My first negative feelings towards CC came once I plonked it into my city layout at the time. Relatively the exterior was much too detailed to fit in and of course I acknowledge CC wasn’t really the problem here but my own buildings were. My second negative feeling towards the modular line came quickly enough after growing tired of seeing the same buildings crop up in AFOL layouts as they became hugely popular so after the first three (which were quickly broken up) I didn’t buy any more. My final position on them however is that they are in fact generally too detailed on the exterior (front), unrealistically too perfect, and poorly detailed on the back and sides. Recent interiors have been good but previously like the ones you mention were very poor. Overall I would be of (perhaps not commonly held) view that the exteriors are too busy partially because they are too different when they are viewed together in a line which is how they are put in a layout. Such variance is a style of you can come across in some parts of older city centres in Western Europe but to me it’s over the top and starting to look like a granny’s wardrobe. I think however it might be fairer to view the first modulars as the start of a new style which I would say has improved in design and quality in recent years (I think the Detective’s Office and Parisian Restaurant are well designed – that said they are still boring!). I think CC is void and characterless now but everything is time relative. I think back in 2007 it was a good build and the designer did a good job in that regard. Designers evolve and new parts come out and designs should improve over time. At the time I did like that I could show it to non-AFOL friends and they would be impressed (at what you could do with LEGO bricks – and look at all those new colours eg Sand Green, Tan!). I think that says enough about its design quality at the time. Finally I think the positive I take from the modular theme is that it brought back some adults into the hobby but a negative is that many MOCers are trapped in a modular world and I think it stifles their creativity. 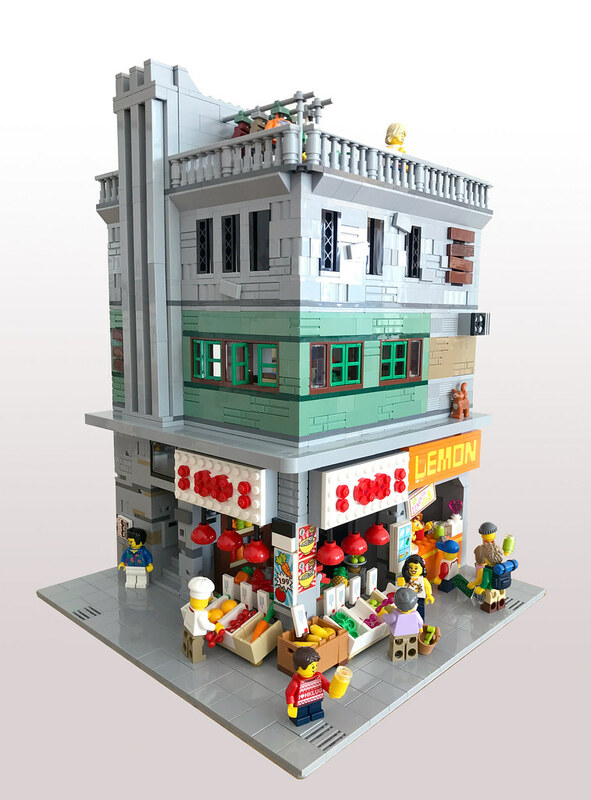 Check out Eurobricks Town MOCs these days, nearly everything is in the busy modular style of late! Regarding 10264 Corner Garage, I would agree that the ground floor looks poor and a throwback to the earlier sets. They could have at least tiled the floor! The style of architecture Lego began the series with begs for detail and ornament. I think I’m drawn to the more recent sets because they’re beginning to tone that down as the style becomes more modern. I'm a fan of more recent styles of architecture anyway. I'll be looking to some of my favourite architects/buildings for inspiration as I move away from official sets. I have a thing for cast concrete and red brick which will be hard on my stock of greys and my wallet (if I have to stock up on dark red and reddish brown). Hope you share some of your builds down the line. Your point is a fair one, the style of the early modulars did require detail. I suppose the style doesn't catch my attention much and a more brutalist concrete style and a decorative-less finish would be more my thing. It's not the style I prefer in real life mind you. Here's a 'modular' creation I found online which has less perfection, less decoration and a more concrete look. I like it except for the fact that it is built on a 32x32 baseplate, another issue I'd have with the modulars. Some buildings with more than 32 studs in lengths would be good to see. Yep i agree with you on this... However i did love the fire brigade modular and bought two and built my own version with two bays. I have the palace cinema, detectives office and pet shop. I would like the brick bank & the diner the fishing tackle shop is an interesting one. But i think the future and way forward is to design & build your own modular mocs. @David -- Yeah, I’m into that. The interior of the shop is great too. The urban Hong Kong- / Tokyo-style buildings are lovely, they really know how to make use of tight spaces. Tadao Ando is one of my all-time favourites when it comes to concrete. @Taylorbrick -- No more official sets for me, mocs are where I’m headed. The Old Fishing Store is a great detailed set but I think its not a modular or at least in the modular line although I see it is built on a 32x32. This is more suburban than urban but Japanese style. Fan?